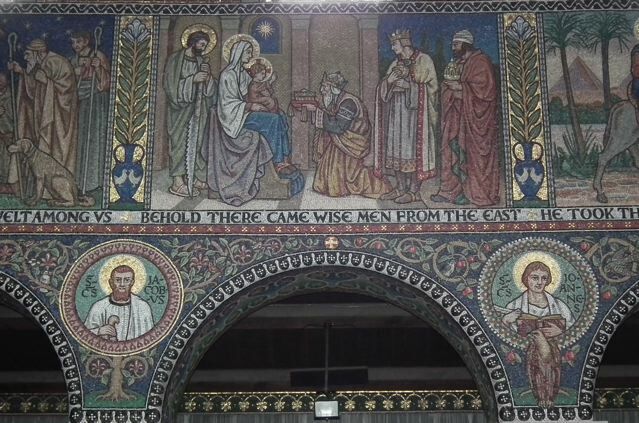 I wanted to show you one more mosaic from the church of the Sacred Heart and St Catherine of Alexandria, Droitwich, the building that featured in the previous post. 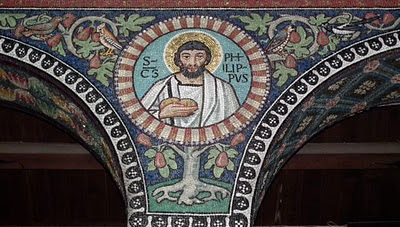 This image of St Philip shows the Apostle carrying bread, having been present at the miracle of the multiplication of loaves and fishes (the “feeding of the five thousand”). 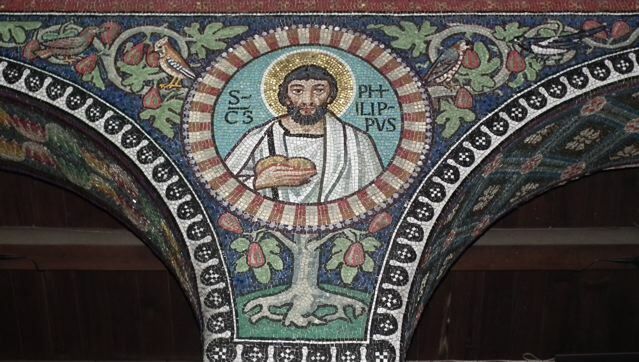 According to St John's Gospel, Philip remarked of Jesus’ five thousand followers that, “Two hundred pennyworth of bread is not sufficient for them, that every one of them may take a little.” The mosaic is also remarkable for the surrounding leaves and fruit, plus the charming population of birds with which the designer, Gabriel Pippet, enlivened the areas around the saint’s portrait. 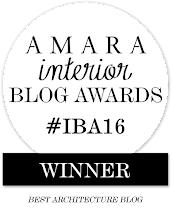 I hope this blog has brought some interest and pleasure to my readers this year and that some at least of the pleasure has come from unexpected sources. I like to think that quite a lot of what I bring you is out-of-the-way stuff, buildings that are little known outside their immediate neighbourhood and passed over by the standard architectural histories. My subjects interest me for all sorts of reasons but the ones I like best are notable aesthetically while also throwing some light on the past – on social, industrial, or commercial history. So this year we’ve had, among other things, village lockups, in which quirky architectural form embodies past notions of crime and punishment; factories, in which low-cost, utilitarian architecture survives (sometimes by the skin of its teeth) to tell the stories of past industries; and shop fronts, in which former fashions in display reveal something about the ways in which retailers liked to catch the attention of customers. All very revealing and often surprising too. Christmas, though, is a time when surprises come in traditional packaging. This fact came into my mind when I was looking at a building that combines tradition with surprise: a 20th-century Byzantine-style church…in Droitwich. The Catholic Church of the Sacred Heart and St Catherine of Alexandria, designed by Barry Peacock, is based on the form of early Christian basilicas. The long nave, with its rows of seven arches, its small apse housing the high altar, its carved capitals, and, above all, its mosaic decoration, shows the influence of the great early churches of Constantinople and, especially, Ravenna. 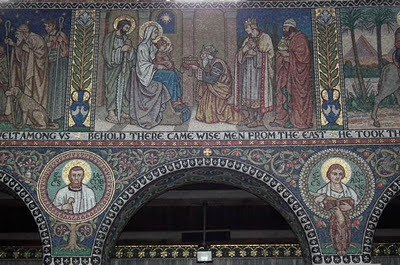 Most of the mosaics were designed by Gabriel Pippet and executed by mosaicist Maurice Josey. Their subjects are various – one group tells the story of St Richard de Wyche, Droitwich’s saint; another depicts scenes from the life of the Virgin, including the Annunciation, the Nativity, and the Flight into Egypt. There are also portraits of saints and fathers of the Church – St Catherine’s mosaic in the apse of her little chapel is especially good. The details in these mosaics are beautiful. Interweaving plants and little groups of birds fill the gaps between the figures and narrative panels. Gold tesserae glitter. Even on a dull day in Droitwich, this lovely work of the 1920s catches the light like the mosaics of Ravenna in the Italian sunshine. Season's Greetings to all my readers. I know I’ve gone on about swans on this blog before. About their seductive combination of strength and softness, their place in English tradition (swan-upping), their role in poetry and mythology, their presence near buildings such as the Archbishop’s Palace at Wells, even the memorable appearance of these usually quiet creatures in English music. Swans get me going, and there it is. I was reminded of all this a while back when passing one of my favourite inn signs, which protrudes from the front of the Three Swans in the middle of Market Harborough. History books say that the first mention of the inn – then simply The Swan – dates from 1517. By the 18th century it was well established as a coaching inn, with stables at the back servicing regular coaches to London. 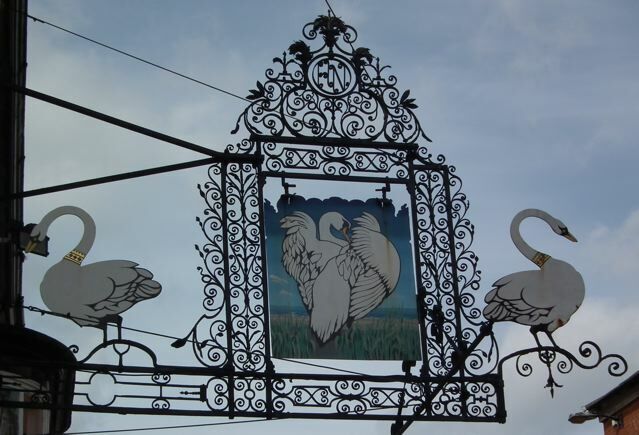 The central portion of the sign is probably the oldest – some sources guess 17th, others 18th century, when the inn was still The Swan. The collection of curlicues shows off not just the central sign but also the work of some local blacksmith. He was fortunate indeed to get the chance to display his work in such a prominent place, and took full advantage of the chance for a free advertisement. 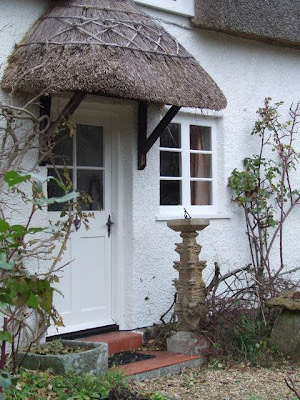 For who would not want a garden gate, or some andirons, or a trivet made by this craftsman? 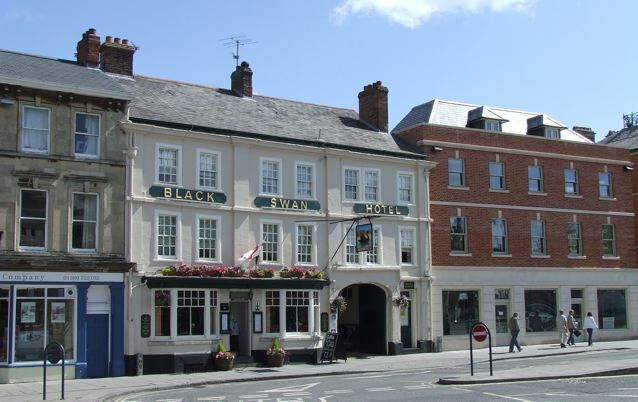 At some later date, perhaps in the later-18th century, perhaps in the early 19th when the building was remodelled, the hostelry added a further two swans to its name and its sign. The smith’s successor came along and attached them in place, and, with their sinuous necks and the equally curvaceous ironwork that they bookend, they make distinctive silhouettes against the sky. No doubt I’m not the only one to crane my neck in homage. 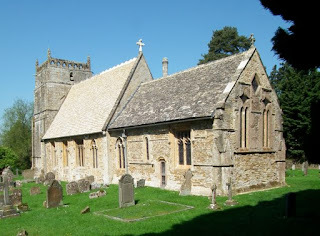 Back at the beginning of the year I did a post about the church at Isle Abbots, which has one of the graceful late-medieval Gothic towers for which Somerset’s parish churches are justly famous. Around the side of the church I was fascinated to find a few masonry fragments that had been removed from the building at some stage, probably during a restoration. One of them is the part of a pinnacle shown in my photograph, and what’s particularly interesting about it is that it has a piece of metal sticking out of the top. This is a rod, probably made of lead, that was used to help hold this piece and another, now vanished, stone together. Medieval masons used lead in their joints quite often, especially when building intricate, willowy structures such as window tracery, narrow shafts (mini-columns), and pinnacles. They did this by drilling vertical holes through the pieces of stone and lining them up. Then they called in the plumber – the man who worked with lead – and he undertook the painstaking task of pouring the molten lead in from the top. When the lead set, the pinnacle had a solid armature, adding greatly to its strength. Working with molten lead in this way must have been a perilous business, especially if you were at the top of a 200-foot tower at the time. 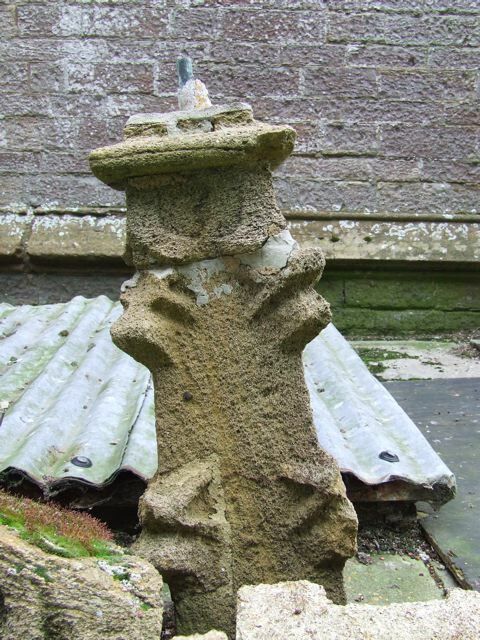 But it seems to have been a common occurrence in the Middle Ages, and helped architectural details such as this pinnacle survive from the 15th to the 20th or 21st century. Now some of these parts of the building have been renewed, it’s good to find some bits of the originals near ground level, so that one can look at them closely. Another medieval pinnacle seems to have found a new role in the garden of a nearby cottage. An alien invader has appeared in the courtyard of the Royal Academy. 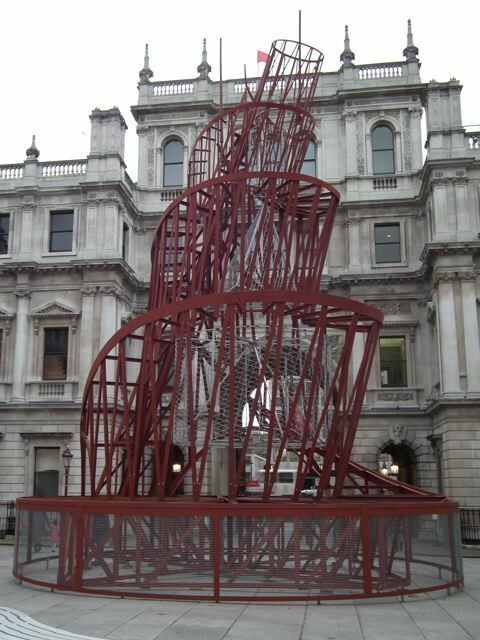 It’s a scale model of one of the great unbuilt projects of Russian communism, the Monument to the Third International, designed in 1919–20 by Vladimir Tatlin and commonly known as Tatlin’s tower. The original was intended to be 400 m high and although known as a monument it was intended to house various functions of the Third International, also known as Comintern, the organization set up in 1919 to fight for communism in Russia and beyond. Inside the tower’s double spiral of twisted metal were to be four structures of steel and glass, each in effect a separate building. These inner structures – in the model they are made of wire – were designed to accommodate separate parts of Comintern. Each was to be a perfect form (a cube, a pyramid, a cylinder, and a hemisphere) and the three lower ones were meant to rotate at different speeds. Perhaps it’s not entirely surprising that this monster monument was never built. The constructional challenges were immense and the amount of steel required was enormous. But not for the first or last time, an unbuilt structure started balls rolling. The idea of its intricate steel network inspired architects and engineers, and the tower (and its enigmatic designer) has enjoyed a long afterlife in books about architecture, histories of the Soviet Union, and even fiction. Now architects Dixon Jones have built this replica to accompany the Royal Academy’s exhibition Building the Revolution: Soviet Art and Architecture, 1915-–1935, which is on at the RA until 22 January. The tower looks rather odd against the Palladian-Victorian background of Burlington House. As I was trying to photograph it, I longed for a neutral background. But the contrast between the constructivist steelwork of Tatlin’s tower and the stonework behind is, I suppose, part of the point. It was always meant to stick out and in its new incarnation in Piccadilly it still does. There are details of the exhibition here. 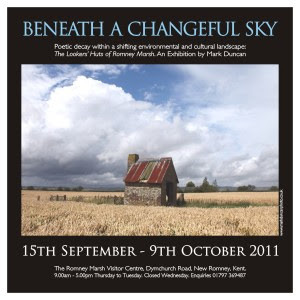 One of my favourite blogs is Adventures in the Print Trade, in which Neil Philip, proprietor of the online gallery Idbury Prints, shares some of his discoveries and enthusiasms. 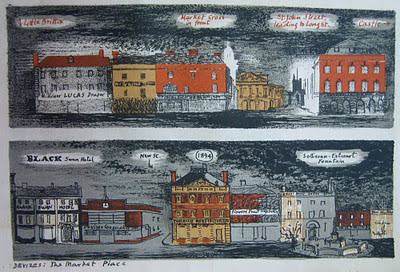 Neil recently posted about some images of 1940s Devizes by John Piper and I was particularly pleased to see these prints because I’d already read Piper’s short essay about the town reprinted in his book Buildings and Prospects (the dust jacket of which is illustrated with versions of some of the Devizes images). 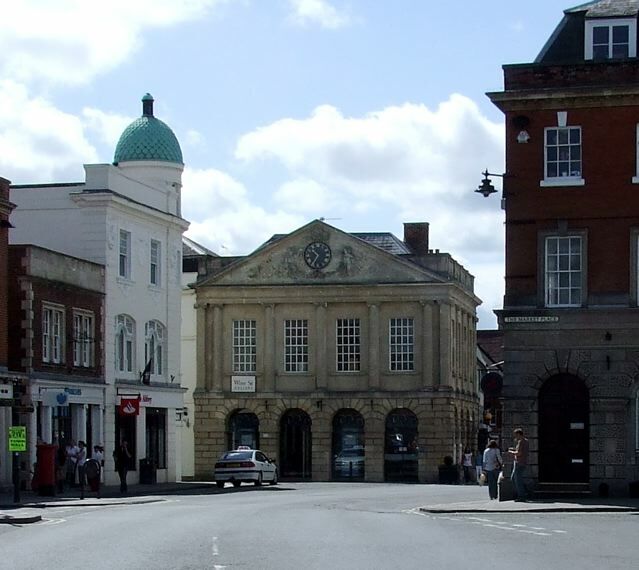 In the essay, Piper praises the town’s ‘good minor architecture, magnificent museum (contents not building), brewery and tobacco factory (sensible, small-scale manufactures for such a town), branch-line railway, good inns and bars, hotels… fair churches and chapels, canal of handsome appearance, sensible plan, bracing air, good-looking inhabitants, cinemas (old-fashioned and super, the super not ostentatious).’ If the place has lost some of these amenities since Piper wrote in 1944, it retains enough of them, from inns to churches, to make it recognisably the same town. Piper’s approach in his illustrations is similar to the way he worked on prints of towns such as Penzance for the Architectural Review. He shows us groups of buildings, throwing light on how they relate to one another along a street, and conjuring up in the process a powerful sense of place. I’ve chosen a couple of examples from Neil’s collection to show what I mean. The simple outlines, blocks of colour, and rapidly sketched details give us the essential information – the shapes of the buildings, their materials, key details such as windows and doors. We quickly grasp the character of the place – a mix of Georgian and Victorian buildings in stone, brick, and colourwash, with a minimum of modern modification. The prints also appeal to me because they bring out an essential difference between the way an artist like Piper worked and the way I work when I point my camera at the same place. Piper could include or exclude anything or anyone he liked from his sketchbook. My camera is not so selective. So when I last went to this town on a busy Saturday morning (and I was pleased to see that the place was busy and the shops well used), I tended not to take general views like Piper’s which would have been full of cars and shoppers, but to concentrate on individual buildings when there happened to be fewer passers-by in front of them. So I went, for example, for the Old Town Hall (also known as the Cheese Hall), visible in Piper’s print down a street of the Market Place itself. This George II building (see my photograph above) shouldn’t work really – the old open arches of the ground floor have been glazed to make offices for a bank. And even in its original state the building was a cobble: an even number of arches (and, therefore, a column in the middle of the façade) is a no-no in Classical architecture. But from chunky ground floor to sculpted pediment it holds together. 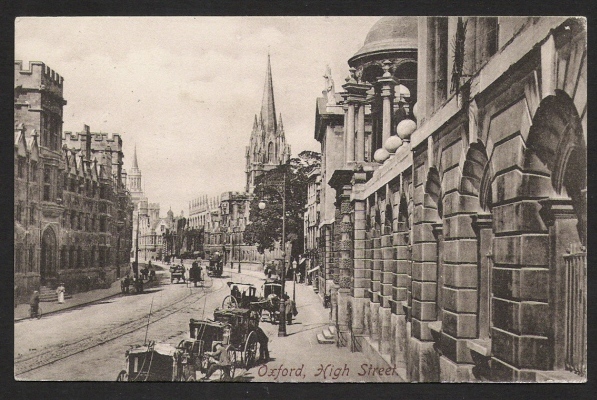 And look how Piper, in the upper print at the top of this post, has caught the context – the distant tower of the church to the right, the elaborate shop (a former Boots) with domed white tower to the left, and the framing buildings on either side. Likewise with Piper’s view of the side of the Market Place containing the Black Swan, a coaching inn dating from the 1730s. His sketchy style doesn’t show as many details as a photograph might, but he’s got the gist of it. 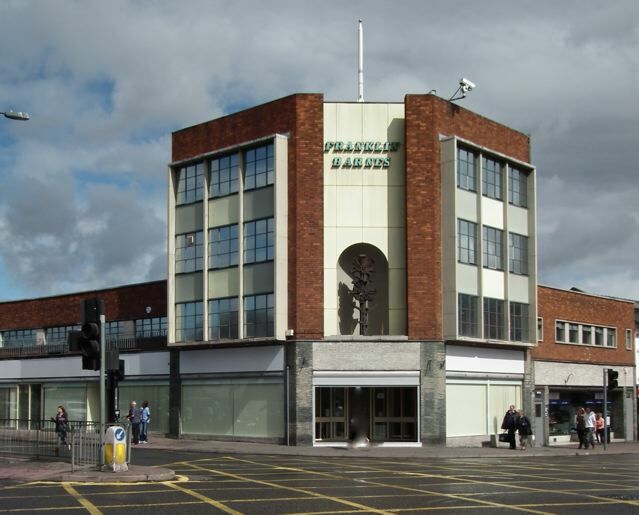 And the setting – including the streamlined 1930s Co-op to the right, now replaced, as you can see in my photograph, with a blander building, no doubt designed to “fit in” to the townscape, but sadly losing the struggle. 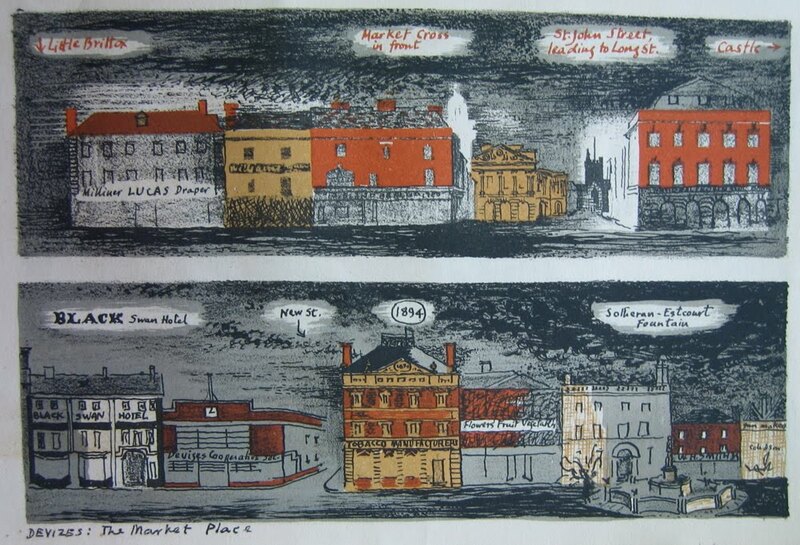 There’s so much more in Piper’s Devizes prints, and looking at them again makes me want to revisit the town and see what other details noted by the artist are still there. These small works show that Piper, whether he was producing a very worked-up, consciously grand, print or painting of a big country house, or these more modest images of a market town, could pack in telling details – and make us look, and look again with fresh eyes. A stomach bug laid me low on Sunday, putting me off my stride and kicking my usual weekend post off the field of play. Here’s a brief post as compensation: one of my favourite pieces of monumental sculpture. This monument is to Charlotte Elizabeth Digby, who died in 1820. 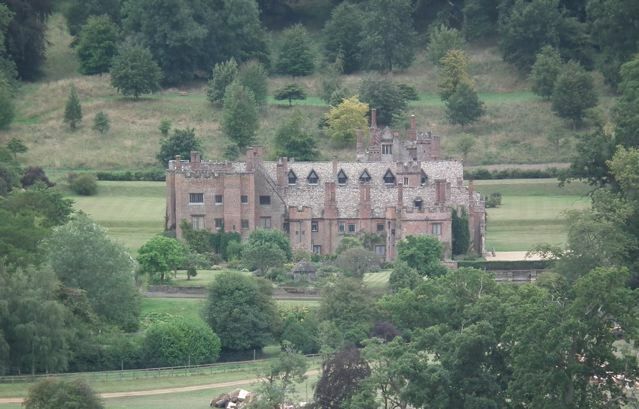 She was wife of William Digby, who was a prebendary of Worcester Cathedral, which is how she comes to be here. 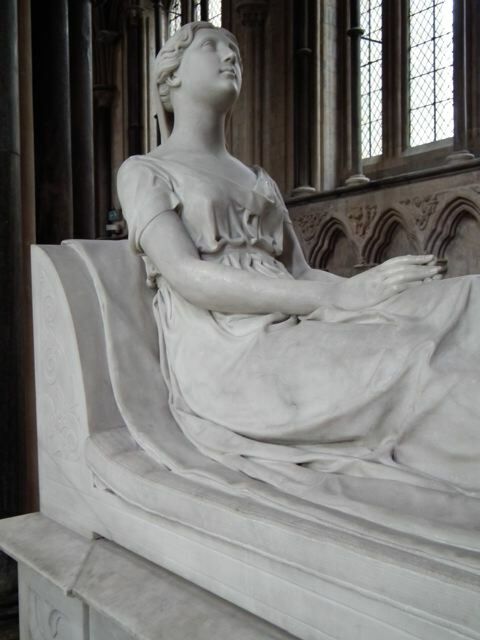 Her monument was created by Francis Chantrey, who completed it in 1825. Chantrey, a prolific sculptor, was famous for his monuments to children. Some of the simplicity of his carvings of children is perhaps also seen in this reminder that after centuries of sleeping figures, putti, urns, berobed belledames, and theratrical gestures, a monument could show simply this: a young woman reclining on a couch, her hands together but not demonstrably prayerful, her head raised and calm, not downcast. Idealized? Yes. Classical? Certainly. But she belongs to the real world too. Here’s another example of a local lock-up designed to be easy on the eye, but in a different style from the round, domed one at Shrewton in the previous post. The ogee-shaped gable, its double curves rising to a ball finial in the centre, is a baroque touch that’s quite surprising on what is basically a small prison. The gable conceals a roof covered in Cotswold stone “slates”, just visible in the picture. Beneath this roof are two separate cells with barred doors and above the doors are semi-circular openings like little barred fanlights. Inside, the cells have stone-vaulted ceilings, to prevent inmates from dismantling the roof and escaping. 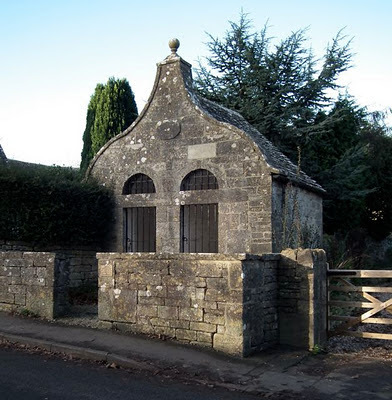 For all the bars, the symmetrical front, with its curvaceous gable and finial, make this lock-up look rather like a picturesque garden building – a rather different visual approach from the usual “castle turret” appearance of many village lock-ups. The double accommodation, in contrast to the usual single cell, sets this building apart too. Bisley is quite a large village, but I don’t know if it was a particularly lawless place in 1824, when this little structure was built. For whatever reason, its builders felt that two cells were better than one. I’ve blogged before about lock-ups, the small village prisons that were used until the 19th century. They catch my eye because they’re often unusual shapes (one like a pyramid, another with a conical top) and because they have interesting roofs, built with heavy stone blocks to make them secure. There are quite a lot of lock-ups still standing. 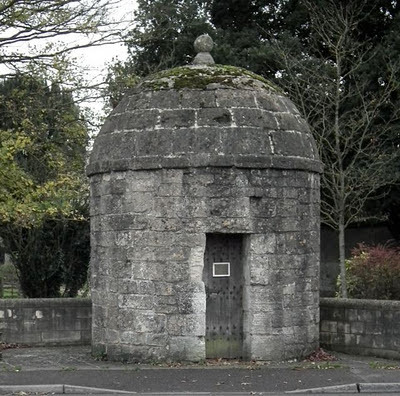 This domed example in the middle of the Wiltshire village of Shrewton is known locally as the Blind House, from its lack of windows. 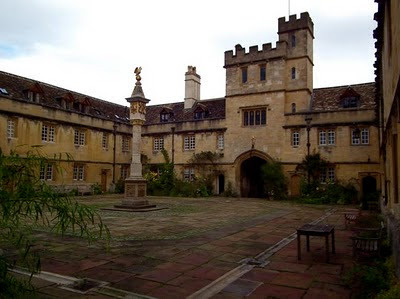 It was probably built in the ealy-18th century, and, as well as being a place to detain local wrongdoers, it may have been used as an overnight stop for prisoners being taken from the Devizes Assize Courts to the gaol at Fisherton. The lock-up has been rebuilt twice – once after being hit by a tank during World War II and once in the 1980s, when it was moved back from its original site very close to the road, to make further mishaps with passing traffic less likely. In its safer, set-back position, it looks solid enough to stay standing for another two or three centuries. On either side of a traditional shop front are vertical features called pilasters. They frame the façade and may be topped with a kind of bracket (known as a console) that helps to support the signboard. Pilasters can take various forms, from plain wooden or tiled uprights to full-blown classical half-columns that reveal how, somewhere in the genetics of shop-front design, the architecture of ancient Greece and Rome is lurking. Few of these designs draw attention to themselves. The shopkeeper wants us to look at the stuff in the window, after all, not at the pilasters. Very often, therefore, designing a traditional shop front is an exercise in restraint. Now and then, though, the inventiveness of Victorian design was unleashed on a shop front with all the ingenuity of Rube Goldberg solving a simple problem. 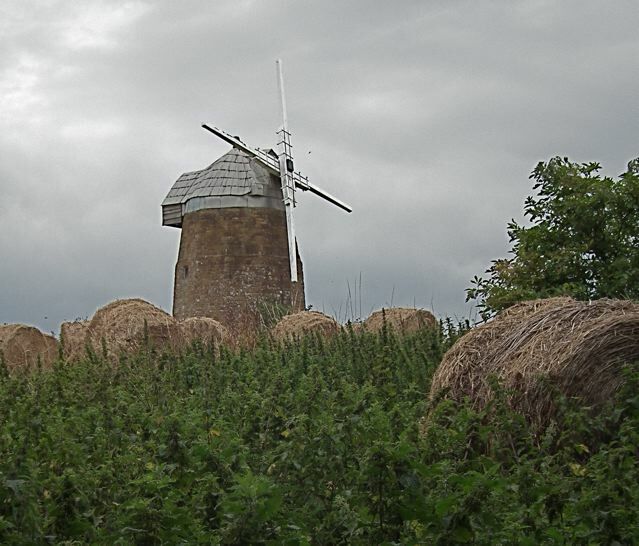 The results include this stunner in Shipston-on-Stour. Here the pilaster is an unlikely mixture of vaguely classical and vaguely Gothic elements, with the addition of a stylized plant that looks as if it’s been borrowed from some Arts and Crafts source. But from plain fluted base to pointed finial it works, and the black-and-white colour scheme sets it off well. Small towns like Shipston, which still have their fair share of small independent local shops, are full of such gems, though few are quite as dazzling as this one. One of the joys of this blog is being able to share finds like this with you all, and to benefit in turn from the sharp eyes of others. 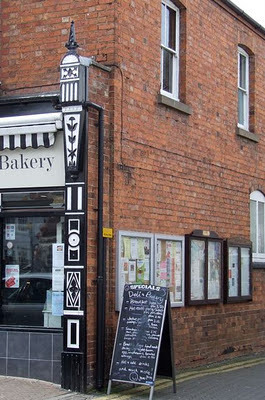 I’m reminded of this because friends who often go to Shipston once told me about this shop front, and encouraged me to do a post about it. I’d noticed it before, as it happens. But their encouragement made me look again, and appreciate it more, and tap it to make sure it was made of wood. Such small acts of togetherness and connection are shafts of light in a sometimes gloomy world. So you want your town to have a dignified civic building, with a hint of classical sophistication, but you can only give your local builder a limited budget. What do you do? For dozens of small towns, building a two-storey town hall with an upper room raised on columns, the answer was to use the Tuscan order. Tuscan, invented by the Romans, was the plainest of all the classical orders. Tuscan columns are plain, without flutes, there’s a base to connect the column to the ground, and the capital is very simple. 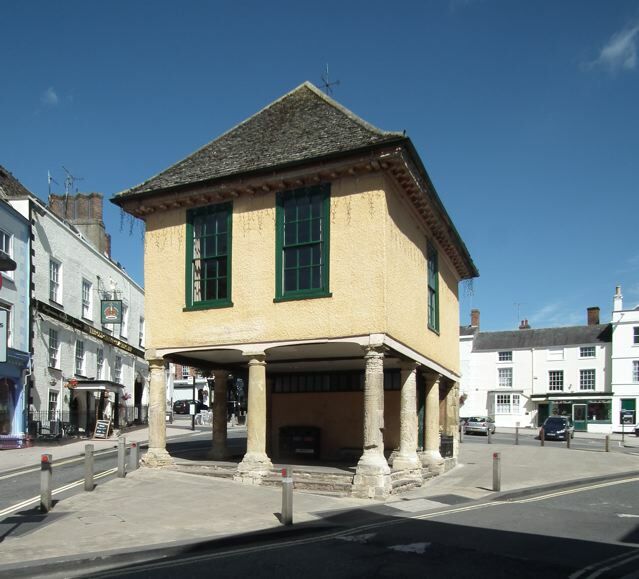 In the late-17th or early-18th century that’s the kind of building that the burghers of Faringdon provided for their town hall. It’s basic and functional, but those Tuscan columns give it just a hint of classicism. It seems that people have liked this building, and found it valuable, because it has survived numerous adaptations and changes of use. It has been, at different times, a library, shop, and fire station, in addition to the combination of civic meeting place, court, and market for which it was originally built. It’s a war memorial as well, as purpose that helped secure its survival when, after World War I, people wanted to pull it down. This town hall is a modest building, a far cry from the glorious structure the citizens of nearby Abingdon built at around the same time. 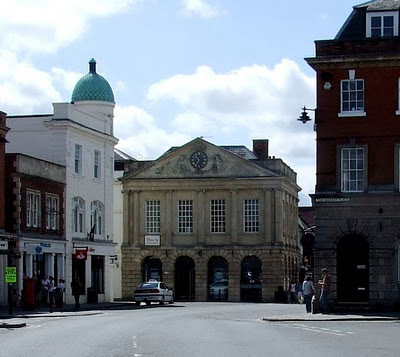 But it’s been useful, and it provides an unpretentious focus for the town centre. Civic pride doesn’t have to involve constructing grand, or grandiose, buildings. There’s room for the little ones too. In compensation for the gloomy picture in the previous post, here’s a more sunny image from earlier this year. 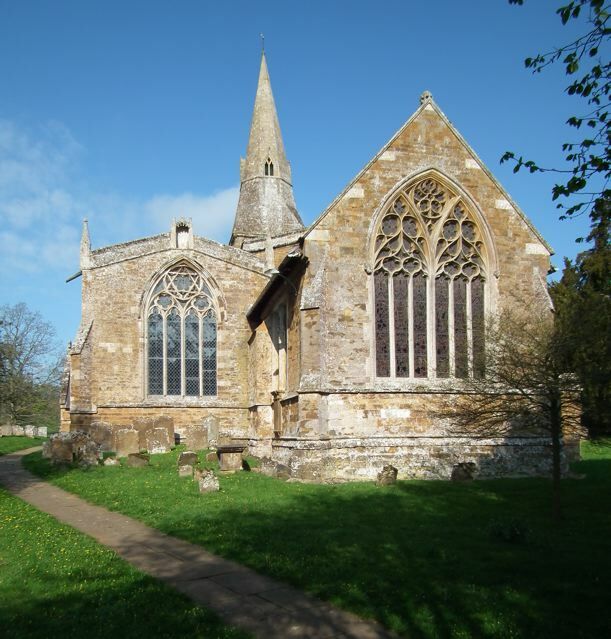 It’s the parish church of Broughton, Oxfordshire, near to Broughton Castle, about which I posted back in April. I chose this picture partly because of the sunshine and partly because of the window tracery. The use of window tracery, the intricate stonework in the heads of Gothic windows, was one way in which the masons of the Middle Ages could put an individual decorative stamp on their churches. Tracery developed steadily during the medieval period. In the 13th century it was usually made up of quite simple patterns, with standard elements such as circles or quatrefoils repeated in a symmetrical fashion. By the 14th century, though, tracery had got much more elaborate. 14th- century windows are often a riot of multiple curves, with stonework making exotic shapes and designs reaching sometimes dazzling complexity. 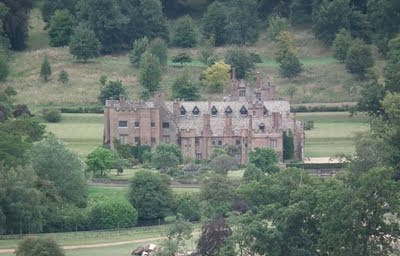 It’s no wonder that the Victorians, classifying medieval architectural styles, called this kind of Gothic “Decorated”. These two windows at Broughton have outstanding tracery of the early-14th century, one ornately geometrical the other curvilinear in the classic Decorated style. The window on the left is a beautiful bit of geometry raised to the level of art. The circle at the top is divided by two triangles to form a six-pointed star, the points of which are themselves small triangles arranged around a central hexagon. But none of these shapes is left plain – they’re adorned with little stone flourishes called cusps, which break up al the straight lines. In the top of the right-hand window there are hardly any straight lines at all: everything looks as if it’s about to melt. Every line curves restlessly this way and that, producing in the head of the window a collection of shapes ranging from ellipses and squashed circles to forms that look like flames or tears. The whole design threatens to fall apart, but it doesn’t, because the layout of the tracery is symmetrical and everything is held together by the emphatic overall pointed shape of the window. We know nothing about the people who built this church, but perhaps they were brought here, or attracted here, nearly 700 years ago by the rich family living in the neighbouring castle. They brought with them skills in geometry and pattern-making together with great visual flair, Add warm morning sun and you have a treat indeed. I know, I know. Today’s building is hardly a beauty. 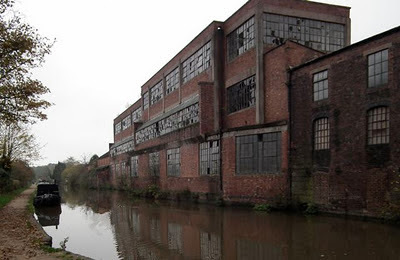 An abandoned, brick-and-concrete factory, built probably at some time in the early-20th century, looking as if it’s waiting for what is tamely known as “the economic downturn” to come to an end before the speculators get busy on another canalside development. 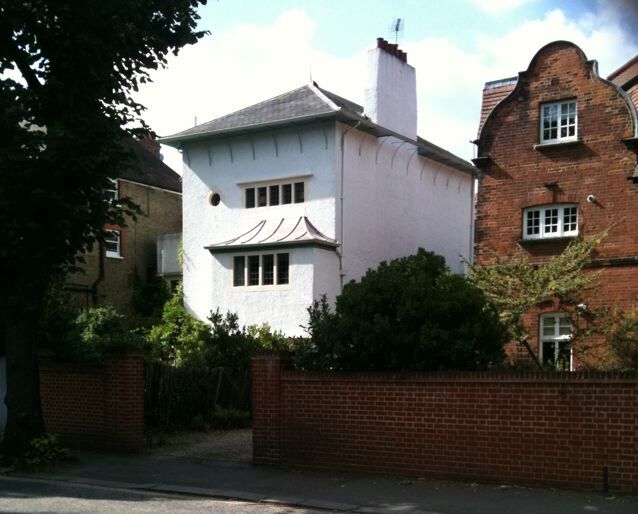 But even such unloved lumpen-architecture has its history and its interest. Look at some film footage of a busy city centre in the early-to-mid 20th century – the period between the two World Wars, perhaps, or even the 1950s. Look at the men and at what’s different about their appearance: nearly every one is wearing a hat.† A sea of trilbies or flat caps in most towns, the occasional fedora or Homburg, endless bobbing bowlers in the City of London. Hats had long been part of the male wardrobe and were long part of the economy – a multitude of hat shops and, in the background, people and companies making hats. So where did they all come from, these hats of yore? If you were rich or upper class or both, you could buy your hats from one of the upmarket hatters in town. But the masses were more likely to wear mass-produced hats made in factories, and for centuries there were several of these factories in the town of Atherstone in Warwickshire. So there it is. Rows of broken windows (facing roughly northeast, to give useful working light, I suppose); purposeful if dingy brickwork and concrete framework; the Coventry Canal. A building that’s not important enough to be listed, or beautiful enough to be looked at by many except disaffected stone-throwers. But a vital part of history and everyday life for past generations of local people. As vital and everyday as the hats on their heads. † They’re in books, too. Once you start looking, hats are everywhere in the literature of the not-so-distant past. From the headgear of James Joyce’s Leopold Bloom, which bears the worn inscription “Plasto’s high grade ha”, to the “disreputable” hat of John Mortimer’s Rumpole of the Bailey, they are rarely items of glamour, but often revealing of their wearers. For treatments of hats and what they mean to their owners, I’d recommend searching out the elegiac piece on “Hats” in Michael Bywater’s glorious Lost Worlds and the short memoir “The Homburg Hat” in Richard Cobb’s People and Places, in which Cobb recalls a train journey to his public school and evokes the cringing embarrassment that can ensue when a teenage boy is not dressed exactly as his peers expect and require him to be. § And now if you buy a hat in the UK from anywhere other than a prestige hatter like Lock, it’s likely to have been made abroad. As an occasional hat-wearer myself, I can report that two of the three in my own wardrobe were made in South and Central America. This imposing red-brick mill was constructed in 1886 and is in many ways a typical 19th-century factory building – its brick walls conceal a metal frame, its rows of windows and long, narrow shape ensure that there’s plenty of natural light inside. 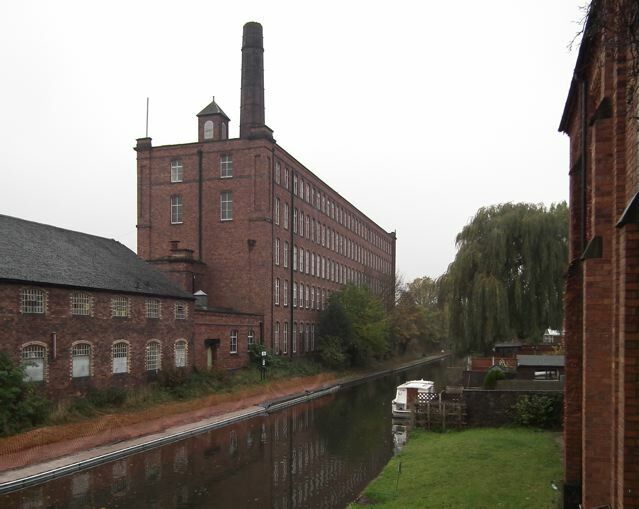 The canal-side site is typical too: from the 18th century onwards thousands of factories and mills were built beside canals, to ensure that raw materials could be delivered with ease and manufactured goods transported across the canal network. So what were the goods produced here? This building was owned by the Tolson family who were manufacturers of narrow fabric strips – basically tapes and webbing. This is an industry that goes back in this part of Staffordshire at least to the 18th century. Tolson’s developed it, making red tape to tie up legal documents, among other products. Their machinery was originally steam driven, with the engine house at this end of the building and the boiler house integrated into the main structure below the tall chimney. I believe that fabric tape is still made in the mill, although parts of the building are now let as separate units to other businesses. The whole building is awaiting refurbishment, but it looks solid and functional (factories like this are among the ancestors of 20th-century functionalist architecture) and should continue to find a use for years to come. Even if the canal no longer brings deliveries, the waterside setting ensures that the building finds its admirers amongst those who pass by in boats – although few of them know about the red tape that circles its history. A couple of months back, en route to a friend’s birthday party in Hastings and running early, I pulled in at Pevensey Bay because the map told me that there were Martello towers there. I’d also read something about plotland developments in the area and was wondering whether I would come across any interesting old wooden buildings or railway carriages made into bungalows. 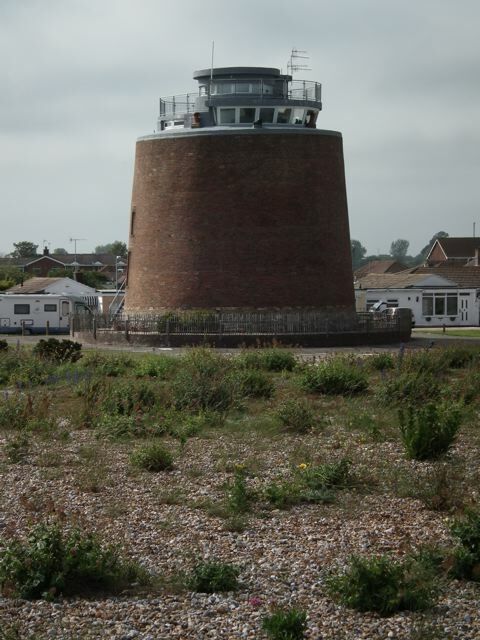 I didn’t find any railway carriages, but one of the Martello towers proved well worth the stop. Martello towers are named after the Torre di Mortella in Corsica and were built along England’s southern and eastern coasts between 1804 and 1812, as part of the country’s defences against a possible French invasion. They are extremely solid brick buildings, with outer walls up to 13 feet thick and roofs at least 10 feet in thickness. They are elliptical on the outside with round interiors, meaning that the outer walls vary in thickness, and the thickest walls, in the narrow ends of the ellipse, face the sea. There were very few windows and the entrance was on an upper level, reached either by a retractable ladder or a drawbridge. Inside, a garrison of up to 24 men and officers lived and waited to train their cannon on approaching enemy shipping. In the event, the towers were not tested by a French invasion, but some 47 of them remain, rendered obsolete by advances in both armour and artillery, as reminders of an age gone by. Each Martello tower was built with a flat top, on which was mounted a single 24-pound gun on a rotating platform that allowed it to be turned through 360 degrees. But this Martello tower at Pevensey Bay is unusual in that it is topped with a later superstructure of glass and concrete. I looked at this and assumed, since the tower had obviously been converted for domestic use, that some architect of the 1960s or 1970s had added this rather purposeful construction on top, to provide some rooms reached by natural light, life in an otherwise almost windowless Martello tower being a rather dingy business. The addition looked for all the world as if the 1960s architect, in love with the “white heat of technology”, had wanted the upper part of the building to look like the top of an airport control tower. But when I got home and looked up the listing for the tower, I found that the reality was rather more interesting. The modern-looking top was actually added during World War II to house range-finding equipment serving a gun battery on the shore in front of the tower. Wartime functionalism looks, not for the first time, like post-war architecture, and the resemblance to a control tower was not accidental, for the wartime users of the tower needed to look out just as much as the occupants of a control tower need to keep an eye on the runway. Now that the tower is used as a home, this two-storey addition, with its rows of windows facing the sea, contains light rooms that must be assets to the owners, as they look across the shingle to the sea. Now we’ve got over Hallowe’en, it’s time to look forward to a festival I’ve more time for: Guy Fawkes’, the night of bangs and whizzes. I’ve always liked a firework, and I’ve been to some memorable Guy Fawkes’ dos in my time, which have ranged from occasions of Handelian gentility to some raucous, politically incorrect, and highly enjoyable displays in Sussex and Kent. And they remind me of something else. 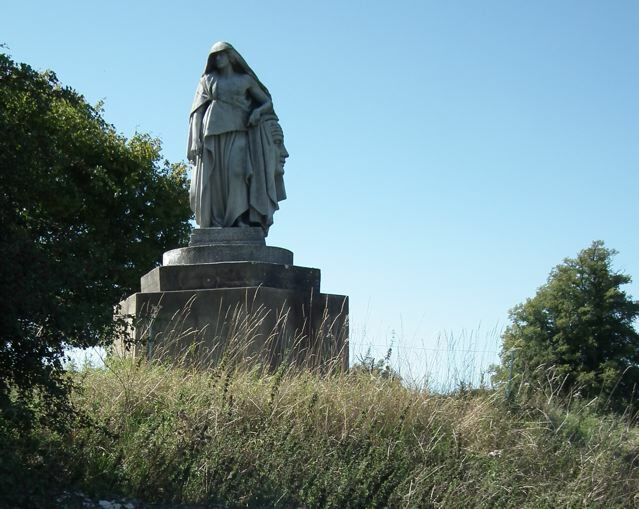 Long ago I lived in southeast London, not far away from Nunhead, an area on the edges of SE4 and SE15 known, if it’s known at all, for being the home of one the capital’s great Victorian cemeteries. Nunhead is also notable for Soper’s, one of London’s best fishmongers, and for the pub that has one of my all-time favourite names: the Pyrotechnist’s Arms. The Pyrotechnist’s Arms is named in homage to Brock’s, probably Britain’s oldest fireworks manufacturers, who used to have their factory nearby. 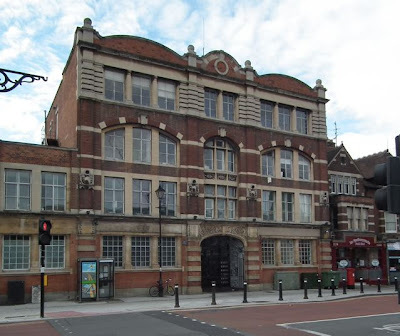 Brock’s began in Islington in the early 18th century and moved south of the river, where they had factories at various locations including Sutton and Nunhead, in the 19th century. They supplied fireworks to the relocated Crystal Palace as well as producing more serious explosives (they sold cartridges to the French army during the Franco-Prussian War). 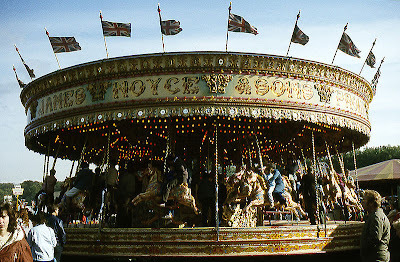 The company seems to have left London in 1910, but lasted until 1988, when it was bought up by Standard Fireworks. 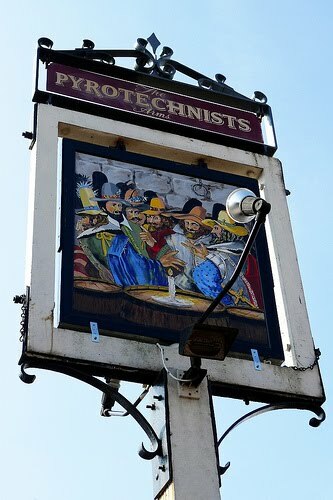 This pub name seems to be the only visible link between this little known part of London and its former industry. I like the group of plotters on the sign – especially the way the artist went to town on their outrageous headgear and the fact that they’ve placed their risky candle on top of the barrel of gunpowder. It’s a reminder that many pub names and signs have links to bits of local history. But few as incendiary, or as unusual, as this one. My overseas readers may find it helpful to be told that Guy Fawkes’ Night, otherwise known as Bonfire Night or simply November 5th, commemorates the foiling of a plot hatched by a group of Catholics who planned to blow up Parliament on November 5th 1605, when the Protestant monarch James I was in attendance, before installing the king’s nine-year-old daughter as a Catholic head of state. Celebrations involve fireworks and bonfires. Compton Verney, the Warwickshire country house and art gallery about which I've blogged before, is holding an exhibition of fireworks until 11 December. I already knew about roundabouts – from books I suppose. They were meant to have mirrors and fairground organ music and flashing coloured lights and garish paintwork and brightly caparisoned horses to ride on and roosters to ride on too and the horses and roosters went up and down as well as round and round and they had these twisted columns like pieces of barley sugar and every one had a name. Even then, having perhaps sensed that the Lincolnshire coast wasn’t exactly the last word in sophisticated holiday destinations, I thought the reality might be a let-down. 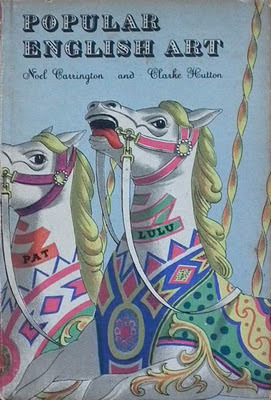 The horses’ ears might be broken or the lights might not flash or it might be closed or there might not be roosters. Well, it wasn’t a let down. The lights flashed, the gallopers really galloped and, yes, there were even roosters. 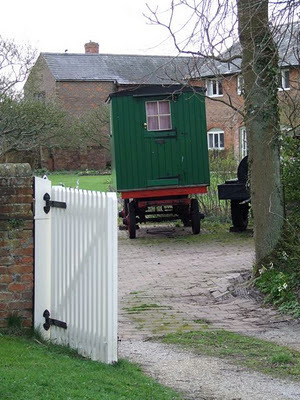 The previous post about Spiegeltents set me thinking about the other kinds of “portable architecture”, from caravans to yurts and gers, that one sometimes sees in the English countryside. I found this example among some pictures I took a while ago in Buckinghamshire. It’s apparently a version of the classic shepherd’s hut,* the movable shelter traditionally used by shepherds on the downs and wolds when they needed to be near far-flung flocks. These wheeled huts, then, are the opposite of the wonderful lookers’ huts of Romney Marsh, about which I’ve posted in the past. The heyday of the shepherd’s hut was probably the 19th century – one thinks of films of Hardy novels. But their history goes back much further. One website on the huts traces it back at least to the late-16th century, when an agricultural writer described how in some places the shepherd “hath his cabin going upon a wheele for to remove here and there at his pleasure”. The huts were originally made mainly of timber, with a wooden body, wooden wheels, and a curved canvas roof, waterproofed with tar, on a wooden frame. Later, corrugated iron was often used for the roof, and now versatile corrugated iron sheeting is generally used to clad the walls too, which may be finished with timber tongue-and-grooved panelling inside. Spoked metal wheels on wide axles are common. This variation seems to have a wooden body on some modern wheels. The stable door, curved roof, and chimney are all features that hark back to the traditional hut. People are still making shepherds’ huts, and finding uses for them as home offices, summerhouses, even shops at visitor attractions. They’re an inspiring example of how a traditional structure can find new roles, its wheels helping it to migrate from the downs to the backyard. 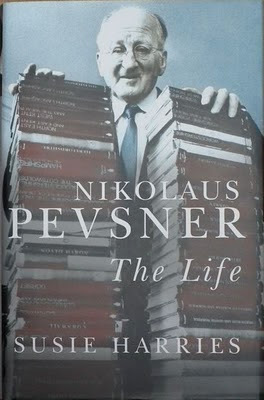 The Cheltenham Festival of Literature has just been on. A large tented village appeared – or rather two tented villages, filling two of the gardens lined with terraces of Regency houses that are among the highlights of Cheltenham’s town centre. As the canvas was alternately heated by the sun and buffeted by the wind, thousands of us sat around while hundreds of authors got on their hind legs to entertain and instruct us on every subject from the Spanish Civil War to the history of the bathroom, from Charles Dickens to Eric Gill. Most of the tents used at the festival are standard-issue white canvas jobs of various sizes but, as I discovered when I went in search of a coffee between events, one of them is nothing less than a Spiegeltent, one of those early-20th-century rococo confections imported from the Low Countries as palaces of entertainment or boudoirs of burlesque. 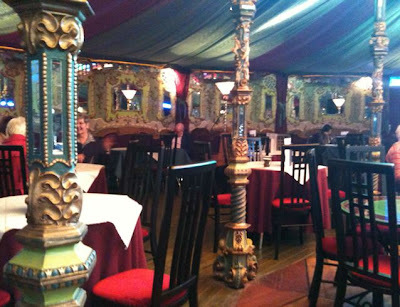 Spiegeltents originated in Belgium and now a number of these antique structures have been restored and are on hire to those who want a venue a cut above the usual marquee. As I went for my coffee I understood the attraction. Gilded fronds and curlicues run up and down the walls, putti and scrolls hang from columns, surfaces are covered with bits of mirror or painted in a fairground palette. Carefully positioned light fittings accentuate the glitter. The richly coloured canvas roof completes the exotic ensemble. Now, I was here in the morning, so did not experience the joys of Kiki de Montparnasse or the provocatively named Ophelia Bitz, two entertainers I believe were billed to appear later in these seductive surroundings. But the rococo environment still delighted my eye as I sipped my coffee and waited to return to the more elevated matters on offer in the rather puritanical white marquees. Apologies for my quick-fire iPhone photo, taken on the hoof and somewhat blurred, but atmospheric nonetheless, I hope. 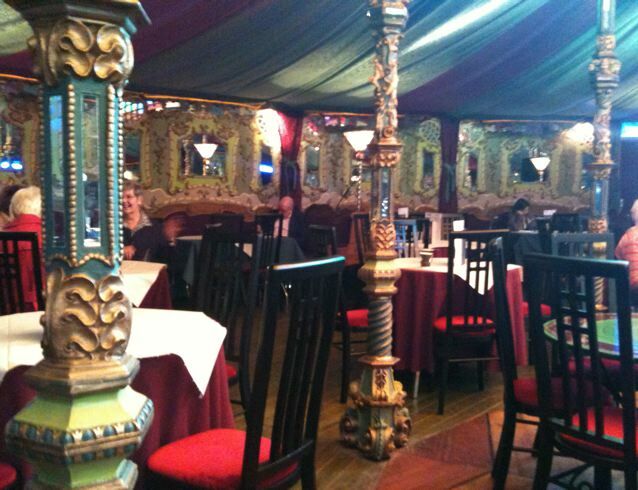 You can find more about Spiegeltents and see more images of them here. I have never forgotten an early school history lesson during which we moved from the Romans to the period after they left the shores of Britain: the Dark Ages. Except, as our history teacher insisted, they weren’t really dark. Illuminated manuscripts, Anglo-Saxon sculpture and jewellery, the vigorous beginnings of English literature, and the very origins of England as a united kingdom – all of these belonged to the post-Roman period and told us that there was really quite a lot going on, some of it wonderfully illuminating. Forty years on, I can’t count the number of times I’ve been told that Dark Ages weren’t really dark. TV historians and archaeologists seem unable to abandon the term, or the notion that, in telling us that the Dark Ages weren’t really dark, they are letting us in on some newly discovered secret about this remote and mysterious period. And yet, reading of the hail-battered and rain-sodden landscape portrayed in Anglo-Saxon poems like The Seafarer, or grubbing about in dark little Saxon churches, some of them almost windowless, the Dark Ages in England do seem somewhat crepuscular. 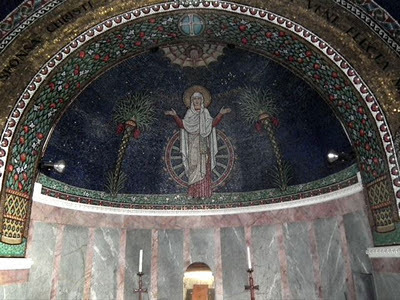 Where are the polychromatic churches of Ravenna, glittering with mosaics? Where are the marble-clad walls of Byzantium? Where the great spaces of early Christian basilicas of the kind we find in Rome? Well, there’s one English church that still gets near to this kind of light, spacious, early Christian architecture: All Saints’, Brixworth, Northamptonshire, though not a glittering jewel box like the churches of Ravenna, is large, light, airy – and Saxon. With its large nave and rows of imposing arches, it has been described as the most impressive 7th-century structure north of the Alps. And it’s an indication as clear as any in England, that the Saxons, builders of small churches like Odda’s Chapel in Gloucestershire or the one at Bradford-on-Avon, could also build big. 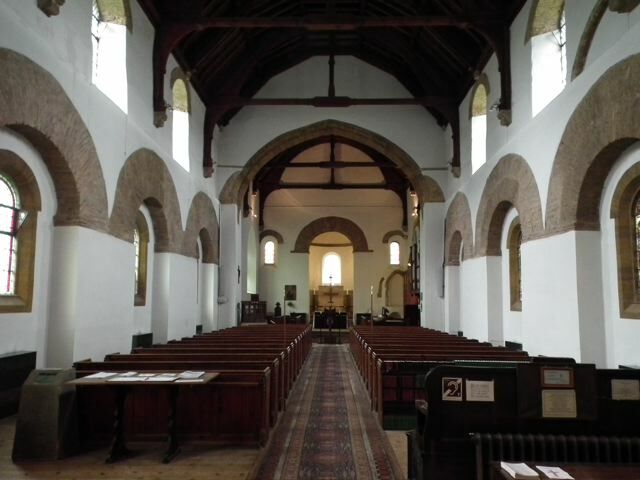 Churches like Brixworth were regional religious centres, and on another level from small, privately endowed chapels like Odda’s. They were monastic foundations – Brixworth was apparently built for monks from Peterborough – and also no doubt places of pilgrimage. They are testimony to the wealth and faith of Mercia, the Anglo-Saxon Midland kingdom, in around 675. The other remarkable thing about this church is the arches. They originally opened on to aisles or side rooms known as porticus, the use of which is unknown (side chapels? homes for holy relics? ossuaries? the jury it out). The porticus have gone, and the arches are now filled in, but their striking construction is still clear. They are made from bricks, and those are Roman bricks, reused from some earlier structure. It’s an inspired bit of recycling, the bricks fulfilling their role both structurally and visually. And it’s a reminder that these Dark Age buildings, which look forward to later churches and cathedrals, are also close to the preceding Roman era. It’s good that these Roman bricks are still enjoying their time in the sun. 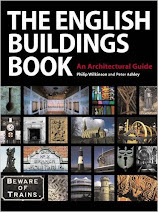 The latest, and, for now, final, installment in my very brief and partial history of English architecture can now be found here, or accessed from the link in the PAGES menu on the right. As with previous installments, this round-up uses examples from this blog with links in the text to the original posts. 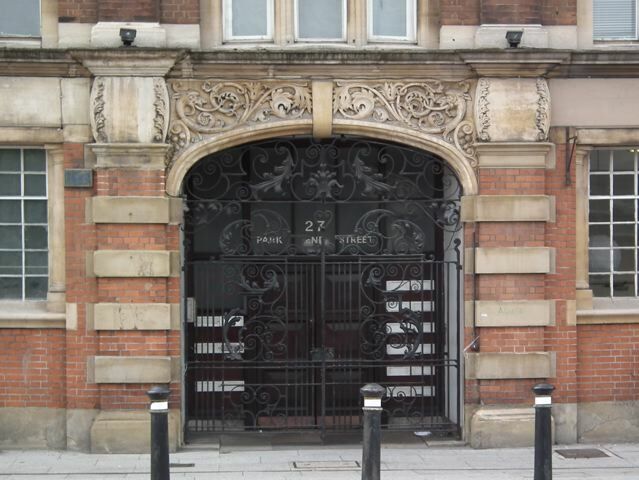 The cut-off point is 1955, the approximate date of the most recent building I've written about in the English Buildings blog. 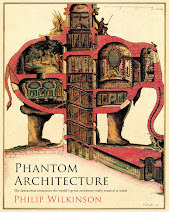 It covers briefly the various styles of the first half of the century, both the backward-looking (for example neo-Georgian) and the various forms of interwar "modern" architecture, from Bauhaus-influenced functionalism to jazzy Art Deco. It concludes, appropriately in this anniversary year, with buildings designed under the influence of the 1951 Festival of Britain. 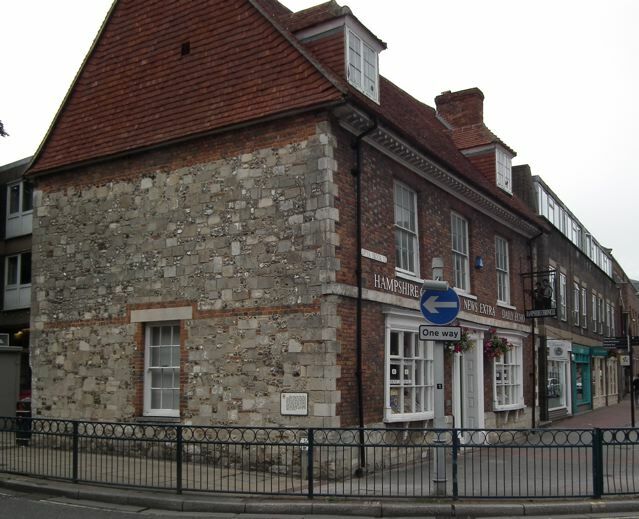 Admiring the front of the picturesque and presumably 18th-century offices of the Hampshire Chronicle in Winchester – dappled brickwork, bow windows, dentil course, tiled roof – I was irritated at not being able to photograph it without also including road signs, railings, and other irrelevant street furniture. So I decided to walk away. 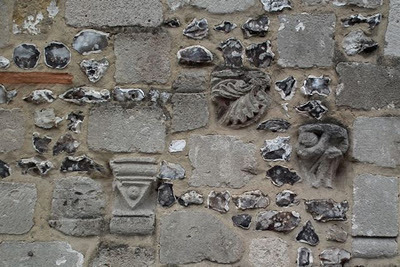 As I did so, I passed the end wall and was delighted to find this remarkable selection of bits and pieces amongst its collage of stone and flint. 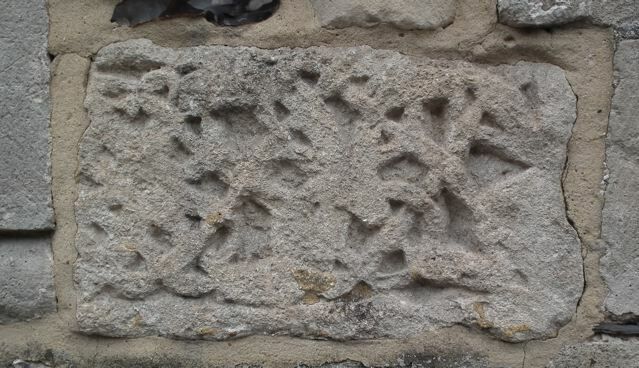 A small iron plaque records that these stones were uncovered in 1959 when the building was being restored, but I expect a lot of people miss them even though the plaque is there to tell them that the stones probably come from the church of St Ruel, which once stood nearby. The selection includes a bit of Norman moulding and chevron, another piece of carving that resembles part of a classical acanthus leaf but may also be Norman, and the piece on the right. Is this a very eroded small figure, or am I imagining things?. There are also some fragments of brick that look Roman, and the larger block below, which bears interlaced Saxon carving. A wonderful group, making one wonder what the church was like, though the collection is not quite as richly eccentric as another wall full of fragments that I posted long ago. Here’s to recycling! The other night I and a small group of neighbours went to visit a local water mill that has been beautifully restored. While I was walking around the outside as the evening light faded, I noticed this shed, and especially its roof, which is covered with corrugated iron – regular readers will know this is one of my favourite materials. 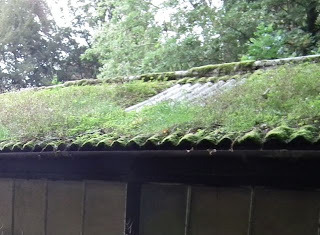 Whether by accident or design, the corrugated covering of this roof has become home to a green carpet of moss, grass, and other plants. 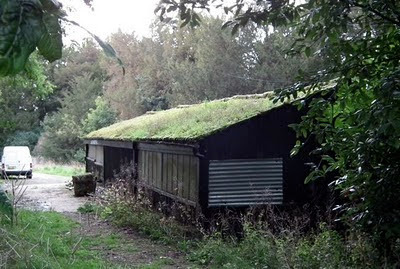 An informal green roof is the result. Green roofs are quite fashionable these days. Their construction usually involves several layers of different materials to protect the roof structure from vapour, water, and roots, as well as a substrate in which to grow the plants. This one, as far as I can see, is just a sheet of corrugated metal with plants growing on it – hence my use of the word ‘informal’. 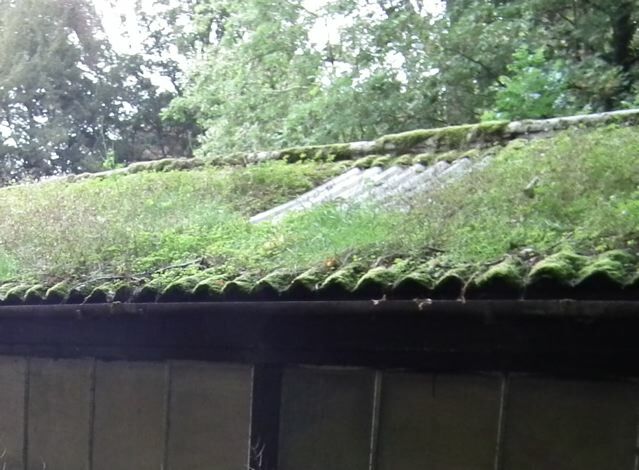 It’s not going to last for ever, but this roof with its covering of greenery is a happy addition to this workshop down a secluded lane surrounded and shaded by trees. I’ve been passing by this building on Hereford’s inner ring road for years. I remember being vaguely aware of it as a teenager (when I was a teenager, I mean, although the building was probably in its teens at the time too). But thanks to a few long waits at the traffic lights I’ve started to look at it more lately. And now the building looks past its best, and the shops on its ground floor look closed, and I’m thinking I ought to share it with you, while it’s still there. Looking at the Franklin Barnes building is also timely because, as many readers of this blog will know, the 60th anniversary of the Festival of Britain is being celebrated, and this looks like a building designed very much under the influence of the kind of modern architecture fostered by the Festival, the sort of modern design that didn’t mind playful use of colour, or sculpture, or whacky lettering – modernism with a human face, as it were. There are so many typically 1950s things about this building. Look at the way the central block is arranged in a series of layers – a central white core, then two slabs of red bricks, then the two layers of boldly framed windows. 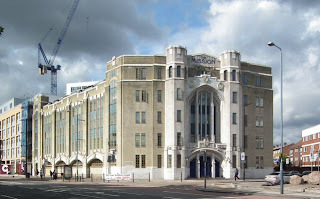 This massing in layers or slabs is very 1950s, as are many other features – the railings on the block to the left, the use of small tiles of grey slate for some of the facing, and that bold lettering, which, if not actually lifted from the Festival Hall or the Lion and Unicorn Pavilion, must have been influenced by the ‘Egyptian’ letters used there. Architects Cecil Corey and Harry Bettington certainly knew how to pull all these elements together. But what was this building for, and who was, or were, Franklin Barnes? Furniture dealers? Electrical retailers? No. The sculpture in the niche gives the game away. It’s a stylized flower by Trevor Worton: Franklin Barnes ran a garden supplies business and florist’s. May their building continue to flourish. So solid, buildings do not generally move. Permanence is one of the conditions of architecture, and when we hear of a building moving, we are apt to get excited, because it’s being dismantled and re-erected stone by stone (like London’s Temple Bar), or because it’s being transported on an overgrown truck, or because it’s suffering from “structural movement”, the bugbear of surveyors and the owners of houses, meaning it’s subsiding, and may fall down. “The crack is moving down the wall, We must remain until the roof falls in” are the relentlessly repeating lines in an eerie poem by Weldon Kees, the American poet who disappeared one day in 1955, not about to let his own house fall down around his ears. Statuary, especially anything made of stone and larger than life-size, also tends to stay put. But sometimes, under the influences of circumstances, accidents, and strong wills, buildings and statues move, or even move together. London’s Crystal Palace, of course, built for the Great Exhibition of 1851, was taken apart and its miles of iron framework and acres of glass were re-assembled in a slightly different form in South London. Later, it burned down, leaving only vast and trunkless legs of stone, or foundations of stone at any rate. Other survivors of these vicissitudes were a pair of statues personifying the continents of Africa and Asia. These figures were bought in 1966 and placed in the park of Faringdon House by Robert Heber-Percy, heir and former partner of Lord Berners. Berners, the “versatile peer”, who had written music, painted, dyed his doves in bright colours, and generally been entertaining, made your standard English eccentric look staid and unproductive. 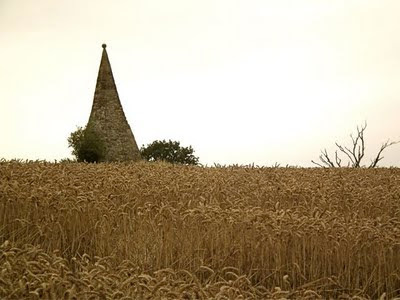 Eccentricity can be fragile, crumbling with the passing of the eccentric, But Berners lives on in his music, his folly tower overlooking Faringdon, and his writings. I like to think there’s something of his spirit in the importation of these statues, one of which, Africa with her sphinx, is generously made visible to the passer-by over the park wall. Made, no doubt, to symbolize Britain’s dominion over the world’s continents, its original meaning is irrelevant in today’s world. Rather than smash it up, though, why not preserve it to remind us how we once saw ourselves and others, in the days before these bulky traces of the Crystal Palace moved from London to a corner of a garden on the edge of an English country town? *I use the old-style English county boundaries. Bristol, an important port for centuries, enjoyed a great expansion in the 19th century, with the arrival of the Great Western Railway and the building of many warehouses, shops, offices, and factories of various kinds. One of the most outstanding buildings from this period is the Welsh Back Granary, built in 1869 to the designs of locally based architects Ponton and Gough. The architects chose a Byzantine revival style, though the multicoloured brickwork (courtesy of the Cattybrook brick pit at Almondsbury) owes a lot to the influence of Venetian architecture too. This is a style, sometimes known as Bristol Byzantine, that may have developed after Ponton and Gough got to know John Addington Symonds, literary critic and historian of the Renaissance, who was born in Bristol. The use of a mix of Venetian and Byzantine elements, though, which recalls the architecture of some other Bristol buildings I’ve posted in the past, also suggests tbat the Bristolians were trying to associate their city with two of the world’s most famous maritime cities, Venice and Istanbul. 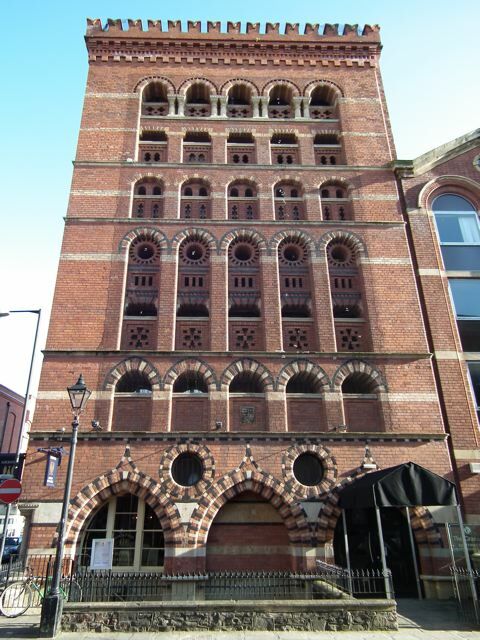 Built to store grain, the Welsh Back building was highly functional – all those pierced openings were to ventilate the grain as it was dried by the heat from fires on the lower floors; the round holes close to the ground-floor arches contained chutes through which grain could be released to waiting carts. But what high-octane decoration – polychrome bricks, pointed Venetian battlements, natty pointed arches, restless patterning – cloaks this functionality. Part palace, part silo, this building is designed to dazzle. In the late 1960s and 1970s, there was a jazz club here, which metamorphosed into a rock venue in the 1980s, all of all seems rather appropriate for this loud and colourful structure. There’s a more sedate restaurant in the base of the building now; the dazzling brickwork remains.